Forty years ago, Supervisor Harvey Milk was shot five times and succumbed to his wounds inside San Francisco City Hall. As one of the first openly LGBTQ elected officials in U.S. history, Harvey Milk’s life and death became a stirring symbol of the LGBTQ movement’s determination to secure equality through political representation in government. Forty years later, 596 openly LGBTQ leaders are in elected office nationwide, a testament to Harvey’s impact and legacy. THE HARVEY MILK LGBTQ DEMOCRATIC CLUB in partnership with Supervisor Rafael Mandelman‘s office held their annual vigil in honor of slain Supervisor Harvey Milk and Mayor George Moscone. On November 27 in Harvey Milk Plaza, at 7 pm, members of the San Francisco Gay Men’s Chorus opened the ceremony performing “Singing for Our Lives.” There followed reflections from Tom Ammiano, Harry Britt, Gwenn Craig, Carol Ruth Silver, Cleve Jones, Anne Kronenberg, Danny Nicoletta, Medora Payne, Debra Jones and Michael Wong. About an hour later, the crowd marched to City Hall, where we were welcomed by Mayor London Breed. Unfortunately, the scheduled speakers could not speak due to rain. So, we missed all this: reflections on George Moscone by Willie Brown, Jr.; and words on the movement that Milk founded in today’s context from Milk Board Presidents Carolina Morales & Honey Mahogany, Supervisor Rafael Mandelman, DCCC Chairman David Campos, Persia, Felicia Flames Elizondo, Donna Personna and queer labor speakers Jessica Etheridge and Brandy McDaniel. Instead, Cleve Jones called for a moment of silence, and sent us all energized to our homes. Earlier at 5 pm, the Nasser family and the Castro Theatre had shown an encore presentation of Robert Epstein‘s The Times of Harvey Milk free of admission to the general public. Donna Sachet’s SONGS OF THE SEASON, benefiting PRC (formerly Positive Resource Center), returned with a new line-up of talent, curated by Brian Kent on November 26, 27 and 28 at Feinstein’s at the Nikko Hotel, a legendary venue. The show delivered (as usual with Donna’s events) an evening filled with a variety of locally and internationally recognized and spirited entertainers; all determined to usher us into the joy and excitement of the holiday season. We smiled, laughed, applauded and even shed a nostalgic tear or two as a talented group of performers and friends joined Brian Kent in sharing the magic that is Donna Sachet’s Songs of the Season. Performers in the three-night spectacular included Donna Sachet (of course); Brian Kent, Billboard recording artist; Franchie Davis, American Idol; David Hernandez, American Idol (Monday & Tuesday); Leanne Borghesi, NY/SF theater & cabaret artist; Effie Passero, American Idol (Monday & Tuesday); Breanna Sinclaire, opera singer (Wednesday only); Kenny Nelson, singer/songwriter; Kippy Marks, electric violinist; and Dan O’Leary, SF vocalist and actor. 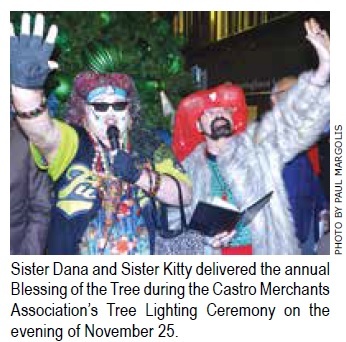 CASTRO MERCHANTS ANNUAL HOLIDAY TREE LIGHTING took place quite merrily on November 26 at the Rainbow Tree in front of Bank of America at Castro & 18th Streets. It was emceed by Donna Sachet and featured Holiday Music and a Sing-Along led by members of the San Francisco Lesbian/Gay Freedom Band, San Francisco Gay Men’s Chorus, Lesbian/Gay Chorus of San Francisco and Golden Gate Men’s Chorus. 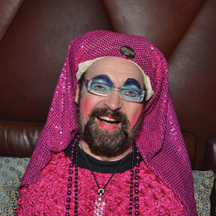 There were remarks from special guests from City Hall and other local dignitaries, including Castro Merchants President Daniel Bergerac, Senator Scott Wiener, Supervisor Rafael Mandelman, SF District Attorney George Gascon and a rousing Blessing and Response by The Sisters of Perpetual Indulgence. Then, Santa and his Elf lit the Tree. Candy canes were distributed to the kiddies by Mr. Claus and his very cute elf. The night concluded with (naturally) “Oh Christmas Tree” by the choruses and audience singing, followed by “We Wish You a Merry Christmas and a Happy New Year.” So, believe it or not, the holidaze are here, queer! LISTEN UP! 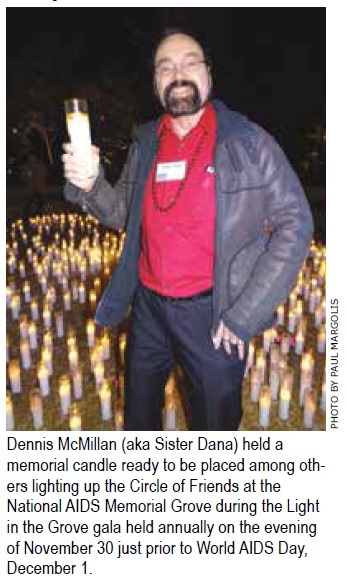 VOICES OF AIDS ACTIVISM was hosted by THE GLBT HISTORICAL SOCIETY on November 29 at the GLBT museum in the Castro. This was the first public showing of video interviews from the GLBT Historical Society’s ongoing San Francisco ACT UP ORAL HISTORY PROJECT documenting the history of direct-action AIDS activism in the Bay Area. The full videos will eventually be made available to researchers and will form the basis of an exhibition in the society’s museum, providing new insights into the contributions of activists as LGBTQ people and people with AIDS fought against the epidemic and the lethally slow response of the government. Executive Director Terry Beswick introduced current project manager Eric Sneathen, who facilitated a lively discussion after the screenings and video clips were shown. Particularly capturing my attention was reliving that horrible “Castro Sweep of 1989” when we ACT UP protesters were being harassed and clubbed and arrested under what the police chief called Martial Law. I was not allowed to return to my home just half a block away. Ugly. On November 29, Senator Scott Wiener (D-San Francisco) announced his intent to re-introduce a bill to exempt compassionate care programs from paying state commercial cannabis taxes when they are providing free medical cannabis to financially disadvantaged people living with serious health conditions. Well, it’s high time! The hilarious 1930s pastiche musical DAMES AT SEA is now on deck through December 16 at San Francisco’s Gateway Theatre, 215 Jackson Street (formerly the Eureka Theatre). This is 42nd Street Moon’s production. The annual DANCE-ALONG NUTCRACKER is Saturday, December 8, 3 pm & 7 pm; Sunday, December 9, 11 am & 3 pm at Yerba Buena Center for the Arts Forum, 701 Mission Street. Each year, the SAN FRANCISCO LESBIAN/GAY FREEDOM BAND blends Tchaikovsky’s classic Nutcracker Suite with a fun theme. The result: a fun-filled musical production brimming with wit, artistry and ingenuity. The talented cast sings and dances their way through a parody version of the Nutcracker. And when the “Dance-Along” sign flashes, the audience is invited to tug on their tutus and sashay along with the cast. Even audience members who don’t want to dance have a blast! This year’s show, with a somewhat fractured Harry Potter theme, centers on the magical adventures of Clara Potter and her friends at Fogwarts School, as they search out the long-lost Elder Baton on a quest to save their school music program.